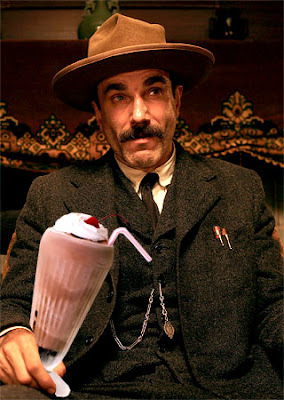 Ok, ok, I know this is a food blog, but I’m gonna go out on a limb for just one moment to say that There Will Be Blood is the greatest f’in movie I’ve seen in a long time. If you haven’t seen it yet, RUN to the theater! Your life will be better because of it. And you’ll also be able to understand all the milkshake references that everyone has been running around and screaming. It’ll also make you want to eat cold steak with your hands. And perhaps grow a big old moustache.